Should bullfighting be prohibited in France? Yes of course! Please participate in this poll and chose for OUI! Some hundreds of anti-bullfighting activists, including former Secretary of State and presidential candidate Rama Yade, demonstrated Saturday afternoon, June 23 on the sidelines of a bullfight feast of the Madeleine in Mont-de-Marsan, denouncing animal suffering and calling for the abolition of bullfights. The joint demonstration organized by CRAC (radically anti-corrida Committee) Europe, and supported by twenty animal welfare organizations, was attended by 600 people. And the manifestations against bullfighting go on…..
… with more determination, with more imagination, with even more shocking images, but this time without any injuries and without any arrests. Around 60 people protested in Istres in Bouches du Rhône this weekend to protest against the cruelty and barbary of bullfighting. Almost every weekend bullfighting events are organised in the south of France, under the names of culture and tradition. 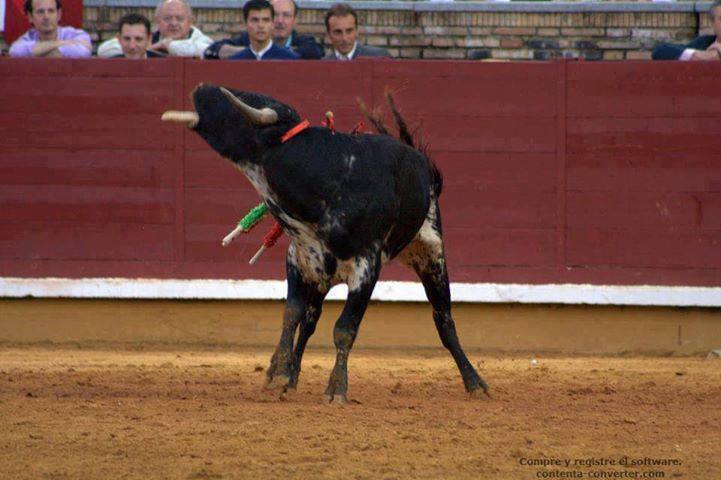 Bullfighting is supported by the prime-minister Mr Valls, who originates from Barcelona, Spain. Even though 70% of the french population is against this cruel sport, no changes in law are to be expected in the near future. But there is a slight decrease in the number of towns that organise these events. So we all hope this barbaric tradition will very slowly disappear over time. …. and it takes several attempts to put him out of his misery. This is bullfighting in France. … for attacking protesters during a pacific demonstration in Rodilhan in 2011. Aquatic bullrun in Sommière (France). They find it fun and cultural. Really? He was the horse of Rejoneador Diego Ventura and his heart stopped very likely because of the fear and stress! Il était le cheval du Rejoneador Diego Ventura et son coeur s’est arrêté, peut-être à cause de la Fatigue et du Stress, en ce fin de Janvier de cette année. Malheureusement ce genre d’incidents n’est absolument pas rare. D’autres exemples ont été rapportés dont le décès de la monture d’un autre rejoneador : Joao Moura Junior, tristement célèbre pour d’autres faits. This is what happens in France when you show your opinion. A baby bull crying for his mom while they stab him to death for fun. All in front of a laughing crowd. You are their voice! Please get involved….do something. Mirror, Mirror on the Wall, Who’s the Cruelest Species of Them All? Sign any on these petitions against bullfighting in France.